""I've ever seen, the 82nd Berlin Honor Guard is the best." On the morning of 23 December 1944, elements of the U.S. 3rd Armored Division were retreating from the Germans in the Ardennes Forest near Fraiture, Belgium. A sergeant in a tank destroyer spotted an American digging a foxhole.The GI, a Private First Class of Co. F, 325th Glider Infantry Regiment, looked up and asked, "Are you looking for a safe place? "Well buddy," he drawled, "just pull your tank in behind me... I'm the 82nd Airborne and this is as far as the bastards are going!" ommanded by Colonel Walter M. Whitman, the 325th Regiment was officially activated as part of the 82nd Division on 25 August 1917 at Camp Gordon, near Atlanta, Georgia. Being a National Army division, the regiment was composed of draftees. The only personnel actually assigned to the regiment however, were a small cadre charged with the task of preparing for the thousands of draftees who would soon be flooding the camp. The unit of which the 325th Regiment was a member, the 82nd Division was comprised of officers and soldiers from what most would consider the "Deep South". This changed a few weeks into the training program. The War Department issued orders instructing the division to send all of its soldiers, minus a 783 man training cadre to other camps. Leaders watched as their soldiers departed to be replaced by soldiers from all regions of the United States. It was noted that the 82nd Division was now made up of soldiers from every state in the union. It is from this fact that the 82nd Division received its nickname "The All American Division" and is represented by the "Double A" patch worn today. Upon their arrival in Lettaure, France, the Regiment began the process of drawing their wartime equipment issued by the British. Steel helmets and gas masks were issued, as well as Lewis light machine guns, Vickers heavy machine guns and a full compliment of Stokes trench mortars and 37mm cannon. Finally, all of the soldiers had to turn in their rifles to receive the British Enfield rifles. On June 16, 1918, the Regiment received orders to move to the Toul sector in France where they would enter the line as part of the 82nd Division under the control of the French VII Army. The British were not happy to see the Americans go. To reinforce this point, they took back all of the equipment they had issued. The Americans received back their "Eddystone" Enfield rifles. They were then moved by rail to central France and hurriedly issued French machine guns. These were the Hochkiss heavy machine gun and the Chauchat light machine gun, a weapon that held the distinction of being the absolute worst weapon of any type used by any side at any time during the war. The Regiment had its first encounter with the deadly mustard gas used by the Germans. They endured a night-long barrage of explosive and chemical artillery. When the sun rose the next morning the soldiers looked out onto a contaminated wasteland. Although the attack on St. Mihiel was unsuccessful, the 325th Regiment held its ground and accomplished its mission. The American offensive in the Argonne Forest was the last major offensive of the war. It was designed to penetrate the German lines and disrupt their logistical base. This was preparatory to further offensive operations involving the actual invasion of Germany. Through ten days of battle, the Regiment was able to punch a hole in the German's last line of defense. With their removal, Allied forces had a clear shot at continuing to advance into Germany. The Regiment had done the hard work and had lost 94 percent of its initial strength. After the war, the colors of the 325th Regiment were cased but were to be unveiled once again on March 25, 1942 under the command of Colonel Claudius Easley. Located at Camp Claiborne, Louisiana, the Regiment was again to be part of the 82nd Division. Late in July 1943, the heavy equipment arrived that would turn the regiment into the 325th Motorized Infantry Regiment. This suddenly changed when the Chief of Staff, General Marshall had decided that the 82nd Division would be an excellent division to use as a base for his proposed Airborne force. General Omar Bradley, because of his excellent work in training the 82nd Division, was to be transferred to the 28th Division which was having a great deal of trouble in meeting its training objectives. General Matthew Ridgway, the 82nd Assistant Division Commander, would become its Commander. 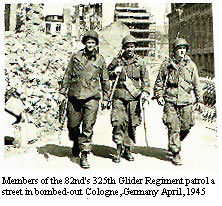 The 325th Glider Infantry Regiment was formed and given the task of arriving into battle by glider. Parachutes could, and often did, wind up scattered for miles on a drop zone. The same held true for equipment and supplies. The glider was the answer to all these problems. As long as a glider stayed in one piece, the items inside it would too. This meant no more searching through the swamp looking for the missing barrel to a Howitzer. Jeeps could also fit into a glider. Best of all, troops could be put into a glider and land as a coherent fighting unit. 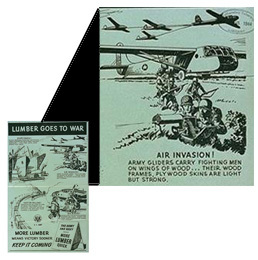 Gliderborne assaults, however, were not without their risks. Gliders and their tow planes were slow, fat targets. They had no armor to protect the men inside. Landing in a glider was also an adventure and little more than a controlled crash. Even if the pilot had the time and altitude to select a good spot to land, conditions on the ground of which he might be totally ignorant could wreck a landing. Ditches, wire, fences, tree stumps or a host of other possible ailments could flip, twist, or gut an unfortunate glider. During the time of its introduction to the gliders, the Regiment lost its Commander. Colonel Easley was promoted to Brigadier General and went to the 96th Division. He was replaced by Colonel Harry Lewis who would guide the Regiment through its glider training and on to combat overseas. The Regiment arrived to its first battle, not by air, but by sea. Boarding beach landing craft, the Regiment was sent to Salerno from the island of Sicily to reinforce American units already there. On September 15th at about 2300, they landed at Paestum, some eighteen miles south of Salerno where they awaited orders. Daybreak on the 16th brought orders. The 2nd Battalion was to re-board the landing craft and farther north to the town of Maiori. Here they were to be attached to Colonel William O. Darby's Ranger Task Force and relieve Ranger units currently holding positions on 4000 foot Mount St. Angelo di Cava. The Battalion was welcomed the next morning by a German artillery barrage. The Germans probed the Battalion lines. Despite numerous attempts to throw the Glidermen off the mountain, the Americans held their ground. It was here that the Regiment received its first casualties of the war. On 7 June 1944, D-Day plus one, the Regiment landed by glider in Normandy and participated in the invasion of France. On 9 June, Private First Class Charles N. Deglopper single-handedly defended his platoon's position and subsequently was awarded the Medal of Honor for this action. As soldiers of the 325th Glider Infantry Regiment swooped down to Normandy, other elements of the 82nd Airborne Division were in the process of capturing the town of St. Mere Eglise on an airborne operation behind enemy lines. 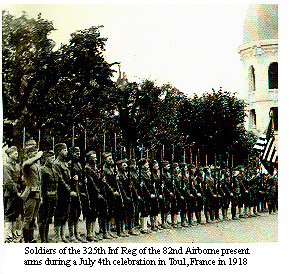 It was for the success of their effort that the soldiers of the 82nd Airborne Division were awarded the red and green braided French Fourregerre. 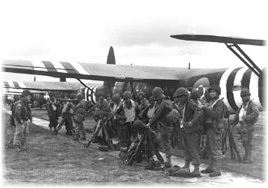 The next glider assault for the 325th was during Operation Market Garden, the largest airborne operation ever conducted. During this battle, the 325th landed among German positions that had surrounded other elements of the 82nd Airborne Division. This glider attack turned the tide of battle and earned the Regiment the Distinguished Unit Citation. Originally, the 82nd Airborne was to defend Bastogne but the 101st Airborne drew that assignment and the 82nd was sent north to Werbomont. The 325th dug in around the crossroads at Baraque de Fraiture and held. During the intense fight in December 1944 The 325th decimated two German Divisions. The fight continued into January 1945. Absorbing heavy casualties the 325th continued on to Thier-du-Mont. Later in 1945, the 325th's action in Germany ended with the Regiment driving deep into the heart of Germany. The war offically ended in Europe on 5 May 1945 and the 82nd Airborne Division was called upon to serve as the occupation force in the American Sector of Berlin. Here the 82nd Airborne Division earned the name, "America's Guard of Honor." The regiment assisted in Berlin occupational duties until it returned to the United States in 1946 and was deactivated on December 15, 1947.